A Borderlands modder appears to have discovered what could be evidence of a new weapon tier heading to Borderlands 2 and 3. CaptainKoby_, the creator of Borderlands 2’s popular Reborn mod pack posted their work on a previously unseen loot tier uncovered in the game’s files. In a tweet last week (which you can see further down this article), Koby posted about Rainbow Rarity. They say it’s “a fully functional rarity added in Borderlands 2.” While the new tier doesn’t seem to have any impact on your gun’s damage output, Koby’s newly-modded take on the weapons does seem to offer a slight cosmetic tweak. It’s worth pointing out, however, that the new weapons are technically not available in-game. The game’s files turned up evidence of the tier after the newly-implented 4K patch, and Koby has only managed to bring them to life via what they describe as a complicated modding process. 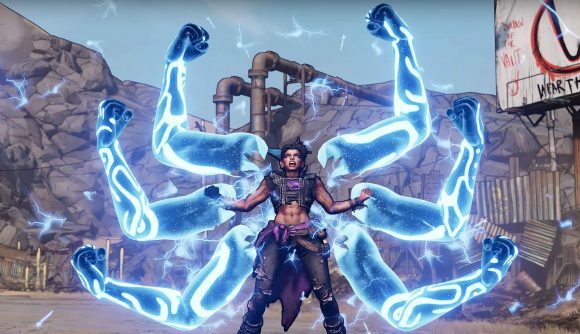 Nevertheless, players are wondering whether the discovery means that they’ll eventually be able to access the new weapons in Borderlands 2, and in Borderlands 3 when it releases later this year. Currently, Borderlands weapons appear in eight different rarities. For the most part, Gearbox has followed the precedent set by Blizzard, with loot ranging from common (white) all the way up to legendary (yellow). Beyond that, however, are three more rarity tiers – orange, dark orange, and pearlescent. If Rainbow Rarity were introduced to the game, it seems as though it would be even more rare than pearlescent. Koby points out that while the files are present within Borderlands 2, there’s no guarantee Gearbox will make the new tier widely available, or that it will appear in Borderlands 3 (or any of the other games, for that matter). Thankfully, we won’t need to wait too long to find out, as the Borderlands 3 release date is only a few months away. It would seem that Gearbox has plenty more to tease us with until then, however – hidden messages have shown up in the game’s marketing teasing the potential return of The Destroyer, the final boss from the first game.